What causes my dog to become stressed? Most domestic dogs suffer some level of stress throughout their lives, simply as a result of living in a state of captivity. Stress is a word we're all familiar with. We also know how it makes us feel. In the short term it changes the way we think and react; it can make us more agitated, aggressive, defensive, or depressed, and impairs our ability to concentrate or remember things. Longer term, it can have a highly adverse impact on both our physical and mental well-being. Not everyone, however, appreciates that dogs are just as vulnerable to the effects of stress as we are. Not only is the phenomenon of stress becoming a bigger challenge for dogs all the time, it can also lie at the heart of so many of their physical and behavioural problems. We all pride ourselves on giving our dogs the best lives we can, but we still can't afford them the total freedom of movement any animal needs in order to feel some real sense of control over their own lives. From pretty early on in life, dogs have to find a way of coping, psychologically, with the reality that humans totally control what happens to them, and that there's ultimately no escape from this state of affairs; different dogs cope with this in different ways. A lot of dogs develop a psychological syndrome called ‘learned helplessness'. The same syndrome can be seen in people who have been taken hostage and then emotionally attach themselves to their captors, or in people who feel unable to leave abusive relationships. What happens is that an individual's confidence in their ability to escape a situation or cope by themselves progressively becomes so undermined that it stops being an option they ever consider. Dogs with higher degrees of learned helplessness can become excessively over-dependent on their owners, psychologically and emotionally, to the point where any separation from them causes great distress. The problem is invariably made worse by owners who greatly infantilise their dogs, treating them like helpless babies, as opposed to intelligent grown animals. These dogs never have a chance to act or think independently, solve problems for themselves, or just generally use the brain and super senses they were born with. Some dogs are naturally more resistant to human control. They're commonly called disobedient or unruly. These are the ‘rebel' dogs you see taking off ecstatically over the horizon once off the lead, and refusing to come back when called. They can also be highly destructive when left alone. Owners frequently think they're suffering from separation anxiety, when in fact they're just trying to escape the state of confinement. Unless better understood, trained, and handled, and given ample opportunities to use their physical and mental energy in more positive ways, dogs like these can suffer enormous stress, due to various never-ending sources of frustration in their lives, caused in turn by all the restrictions placed on their natural behaviour and freedom. The general pressures of captivity apart, there are other sources of additional stress for many modern dogs. The most common source is insufficient physical exercise and mental stimulation. The amount of physical exercise a dog needs daily - particularly for active working breeds - is routinely underestimated by many owners. Physical exercise is one of the most efficient stress-busters around for dogs. Regular mental stimulation is also vital to keep a dog's mind in a healthy state. Owners commonly think their dog is coping with limited exercise and mental stimulation because he's relatively quiet and not climbing the walls or dismantling furnishings with his teeth. Instead, however, he might be totally depressed, which is just another form of stress. Be aware that boredom, especially longer term, rots a dog's brain. It's also one of the most common causes of premature ageing in dogs. Ironically, over-exercising or overstimulating dogs can be just as stressful for them, keeping them in a permanently aroused condition, and making it ever harder for their bodies and brains to return to a calmer state. Noise within our modern human society can be a massive stress problem for dogs, because there's so much of it wherever they go, and they also tend to have far more sensitive hearing than we do. Dogs' stress reactions to noise don't necessarily manifest themselves in an obvious physical way, such as animated, fearful behaviour, as with a phobic dog. This is because stress so often registers on the subconscious mind. In other words, an individual's body is being affected by a stress source whether or not they are consciously aware of it. Recent studies in the USA highlighted how even low-level background traffi c noise, on a consistent basis, raised levels of stress hormones in children, as well as their blood pressures and heart rates, and symptoms of anxiety and nervousness. Yet mostly these effects were occurring on a subconscious level. So next time you subject your dog to the TV going full blast while he's in the room, or to music blaring in the car while he's with you, and honestly think he's taking no notice or doesn't mind, his body may well be telling a very different story, stress-wise. People don't always realise how stressful dogs find it to be shouted at. So many owners shout at their dogs all the time, mostly to externalise the frustration they feel at not being able to communicate with them in a more effective way. When people give their dogs basic training commands - such as recall, sit, or wait - they often do so in a pitch more suited to an irate sergeant major on a parade square than a teacher who treats a pupil with basic civility and respect. Then they wonder why their dogs switch off whenever they ask them to do something, or show resistance to the whole training process. Just imagine how much you would have enjoyed school if every teacher bawled at you non-stop, in a repellently hostile manner, the entire time you were in class. It's also unlikely your brain would have been very receptive to learning. The more quietly you speak to dogs, and the greater the respect in your approach to them, the more likely it is that they will listen to you - not least because as soon as a dog is stressed he stops being able to concentrate or learn. When dogs aren't trained, in any appropriate shape or form, they always lead more stressful lives. This is because they're constantly trying to guess what their owners want of them, and then constantly worry about the consequences of getting it wrong - such as their owner shouting at them or being in some way abusive or disapproving. Training gives owners and dogs an effective way of communicating, cooperating, and interacting with each other, which in turn massively reduces sources of conflict between both parties. When you deprive a dog of his owner, and keep him confined at the same time - as so often occurs in many homes - you basically hit him with two big stress sources at once. And the longer you leave him in this situation, the greater the stress can get. Just because you come home and the house isn't trashed, it doesn't necessarily mean your dog didn't suffer stress during your departure, or that he fully coped. As with noise stress, the effects of confinement/separation stress on a dog aren't always outwardly obvious or manifested in some immediate physical way. Internally, however, they can still take their toll over time. Dogs are often better at coping with pain than humans, which is why so often many owners don't recognise that their dog is actually in discomfort or physical distress unless, or until, he has a condition which becomes acute. 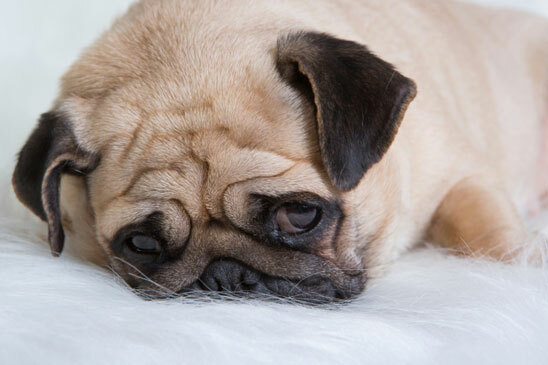 Many dogs who seem depressed or snappy could just be stressed by some ongoing source of pain in their lives. Common causes of this are teeth, gum, ear, or joint problems (such as arthritis). It's so important to regularly check out your dog's mouth, teeth, gums, and ears to ensure they're always clean and healthy. Some dogs will always be more vulnerable to the effects of stress than others. Dogs from highly sensitive, driven, and reactive working breeds, for example, often have a more volatile neurochemistry (and so are far more readily and powerfully aroused by external stimuli). Older dogs can often cope less well with stress, simply because the brain and body get progressively less efficient at dealing with its physical and mental side effects as animals age. Clearly, the more stress your dog experiences in his life, the greater the physical/mental toll this can take on him as he grows older. Very often the more harmful effects of stress in dogs only manifest themselves in things such as physical illness or more severe mental deterioration, over time. And while it might be impossible to banish all sources of stress from our dogs' lives all the time, there are ways of managing and handling dogs that can keep them in a far calmer and healthier state, both physically and mentally. Higher levels of anxiety and of aggression. Heightened levels of reactivity towards other dogs/people/noise. Greater restlessness and more manic behaviour. Persistently licking lips or yawning. Showing less interest in things. Less able to concentrate or comply with previously learned commands. Frequent and persistent barking and/or whining. Development or exacerbation of obsessive-compulsive behaviours, such as tail or shadow chasing. Some of the following symptoms can also signify more serious illness. If in doubt consult your vet. Excess panting (when the dog isn't just physically hot). Suppressed immune system, leading to higher risk of infections and cancers. Abnormal appetite or loss of appetite. Lick granuloma/excessive licking or chewing of legs or paws. Premature ageing and earlier deterioration of brain function.